Smoot Landscapes has transitioned all fertilization services to Dan Henneberg of Greenhawk Environmental Plant Care. Dan is a seasoned professional who helped pioneer the advent of organic-based lawn care in the DC metropolitan area. 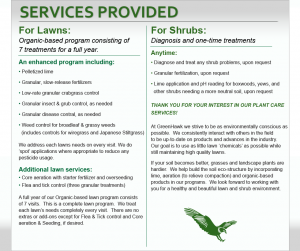 He will work with you to customize your fertilization and weed control program specifically suited to your lawn’s needs. Your account will be handled completely by Greenhawk, and they will bill you per service. Winter* Pelletized lime plus pH test and weed control if temperatures allow. Early Spring Granular fertilizer with crabgrass control and broadleaf weed control. Late Spring Light granular fertilization and broadleaf weed control. Early Summer Granular grub control and broadleaf, grassy weed and wiregrass controls as needed. Late Summer Broadleaf, grassy weed and wiregrass controls as needed. Early Fall Granular fertilization and broadleaf, grassy weed and wiregrass controls as needed. Late Fall Granular fertilization with Gallery broadleaf pre-emergent and broadleaf weed control. *Winter applications will start late January – early February. Sign up today and get on the schedule!